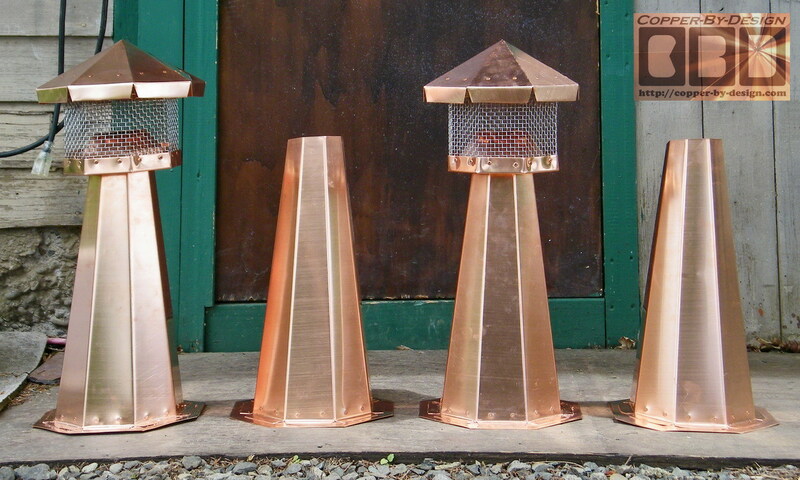 Below is a few more examples of custom copper chimney caps I've made; placing primary focus on a strong design w/as few seams as possible. There's also links to see more photos and details w/price breakdown of the parts used for most projects. Note: We do not intend to be misleading with prices listed on these web pages for chimney caps made prior to to 2006, but with metal and fuel prices having doubled since then we have needed to compensate as well. So keep in mind how the prices listed may not reflect the current cost. They are here as a guide to see what these cost at that time. 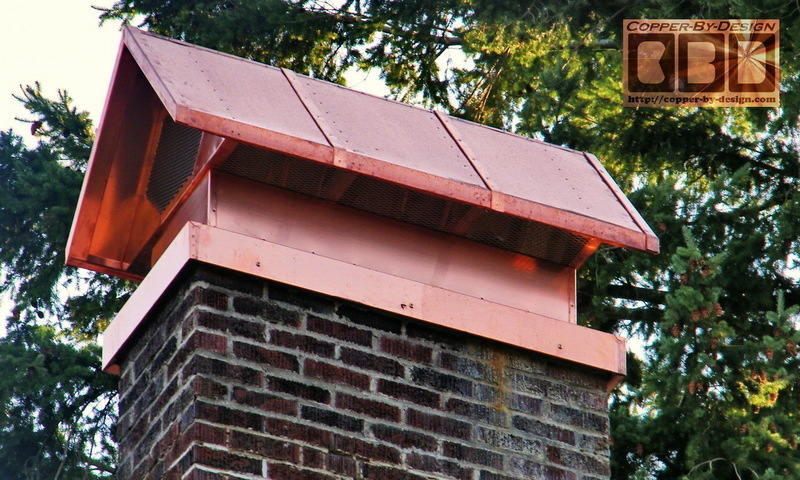 This copper chimney cap is for Mr. & Mrs. Graham in S. W. Portland, Oregon to be installed over a brick chimney and cover the flue liners. 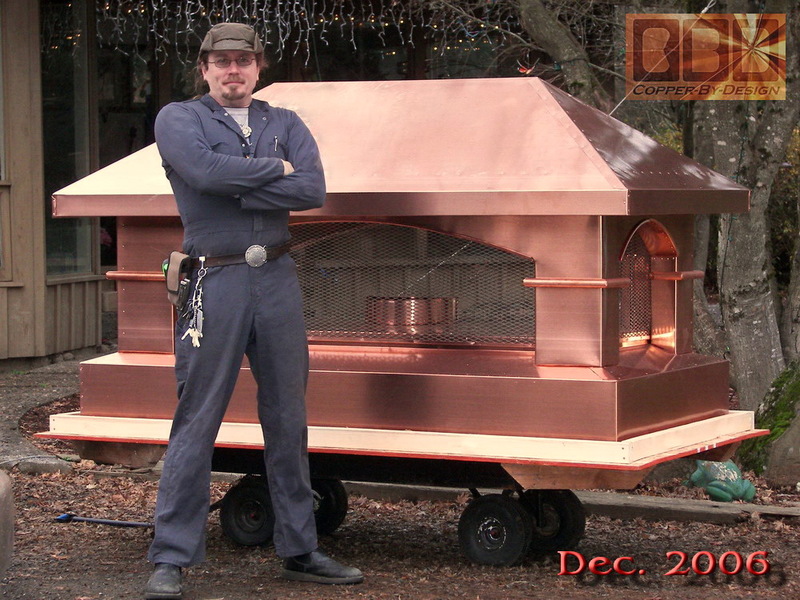 He wanting this built in a gable style roof-line like his house that I am putting copper gutters on. 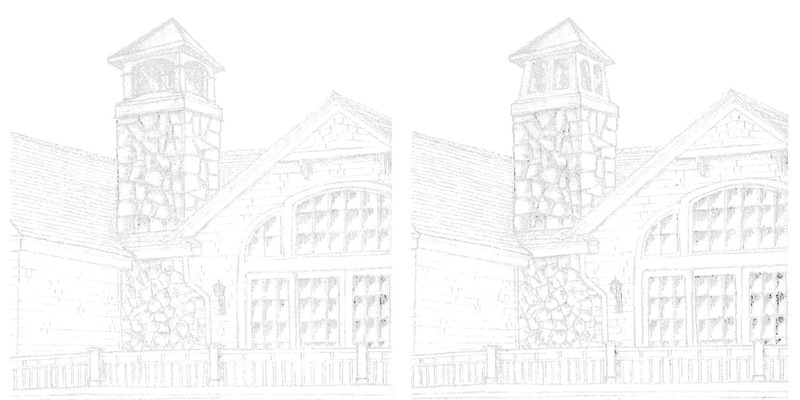 He wanted a fairly simple design that would compliment his house. 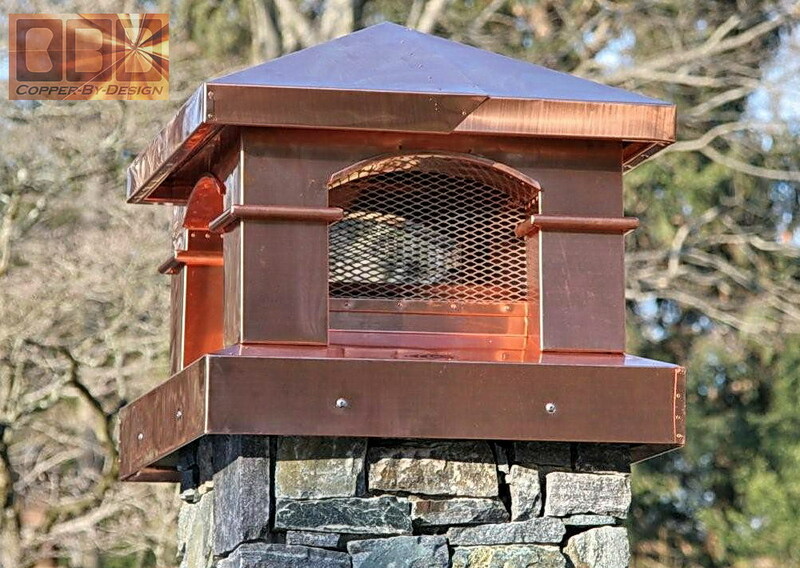 This copper chimney cap was made in my most popular Tuscan arch style for Andy O'Brien in Arlington, Massachusetts to be installed over a newly rebuilt brick chimney. I don't know if you remember me but I'm the guy just outside Boston who was putting a clay roof on himself. 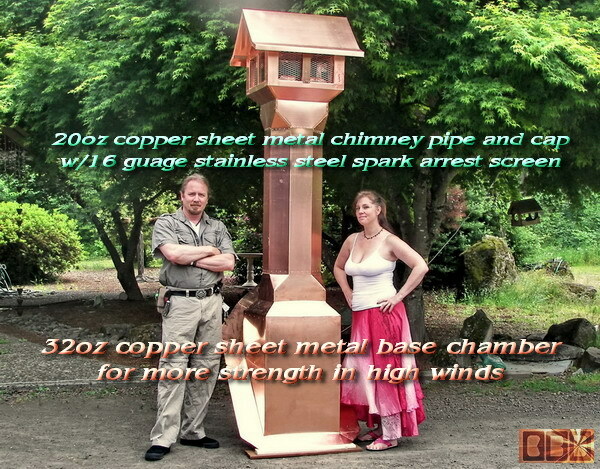 I finally got around to getting the guy who built my chimney to extend the flues. He wouldn't budge on packing the chimney. I ended packing it myself. I had scheduled a crane to place the cap so I didn't have time to finish the top off with mortar. 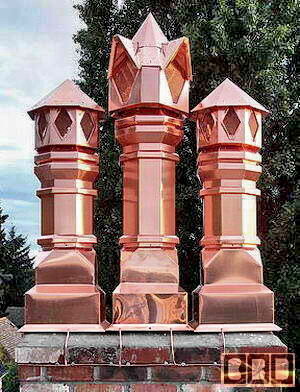 I think the chimney should be OK in my life time. The cap fits great. You were right about the impact drill. It is a great tool. I don't know what I did without ones these for so long. I only set the screws until the cap set solidly. They are sticking out about half inch. Last night a tropical storm passed through. The cap held solid through 60 mile an hour gusts. Even when we get hurricanes 60 miles an hour is the typical wind speed when they get this far inland. Unlike other caps I've had I'm confident this cap will stay set no matter what weather New England dishes out. Because I finished in the dark and the weather I haven't been able to get a decent picture. As soon as I get good picture I'll send it. 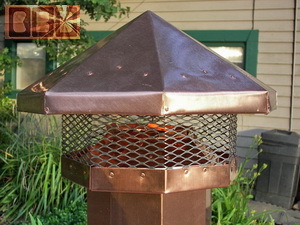 This copper chimney cap is for a lake house for Greg Besio in Glen Arbor, Michigan. We have been working out the design details for over a year prior to starting this for the weather to clear up a spring time installation. 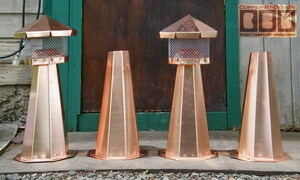 This needs to cover the 3 flues in their chimney. 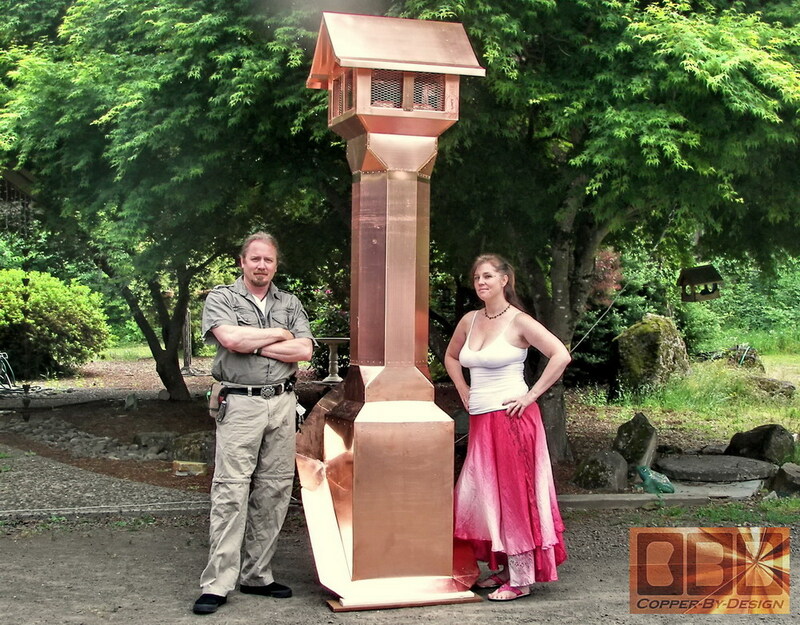 He wanted this to be loosely modeled after a light house on South Manitou Island. 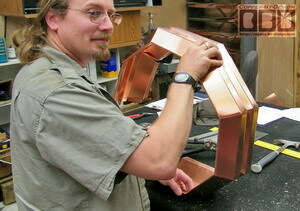 In stead of making it round it is stronger and less expensive made 8 sided. 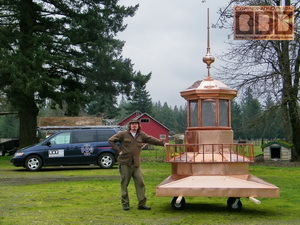 The pan/base is 7' wide, and this whole assembly is over 7' tall and 12' tall with the finial mounted. 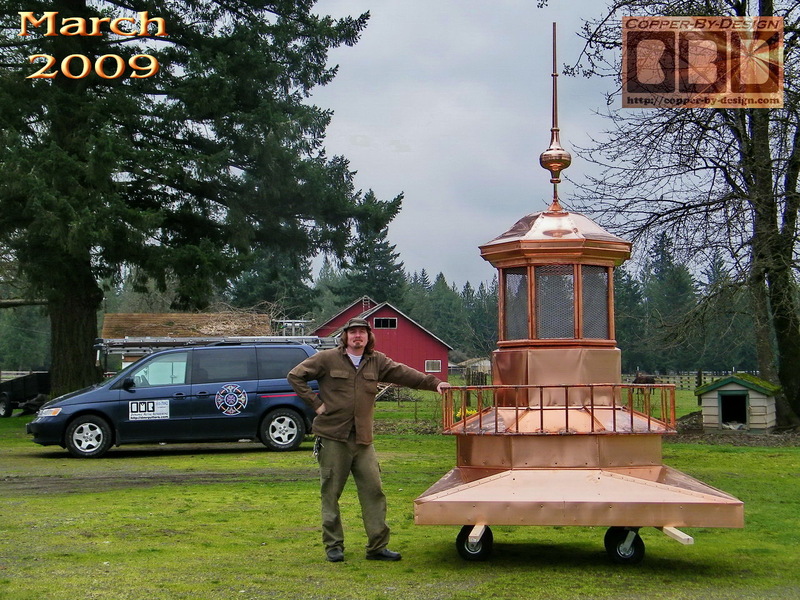 It has a 16 gauge stainless steel spark arrest screen up where the windows would be if this were a real light house. They saved over $2,000 from the extra work and copper I had put into this project over the original quote, but it is a great addition to my web site showing what I can do. Here is a few shots of the hardwood support frame I needed to build to support this lighthouse shaped chimney cap under thick snow loads. 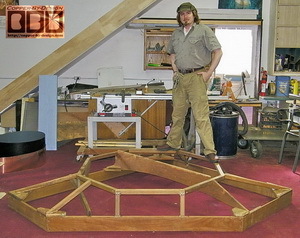 The weight has to be distributed out to the sides of this framework. The corner pieces you see here is what will rest over the top of the 4" thick concrete slab. 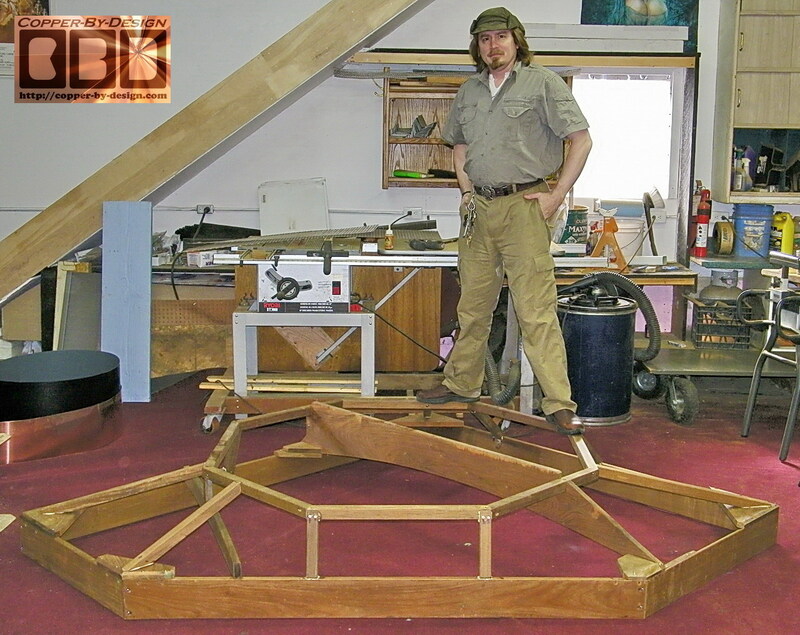 As you can see this octagonal ring is strong enough to support my weigh. The wood frame alone weighs 115# before I covered it with 11 different sheets of copper. I also made a liner inside the ring dropping down and a cover over the one center brace to keep it dry and from exposure to sparks. 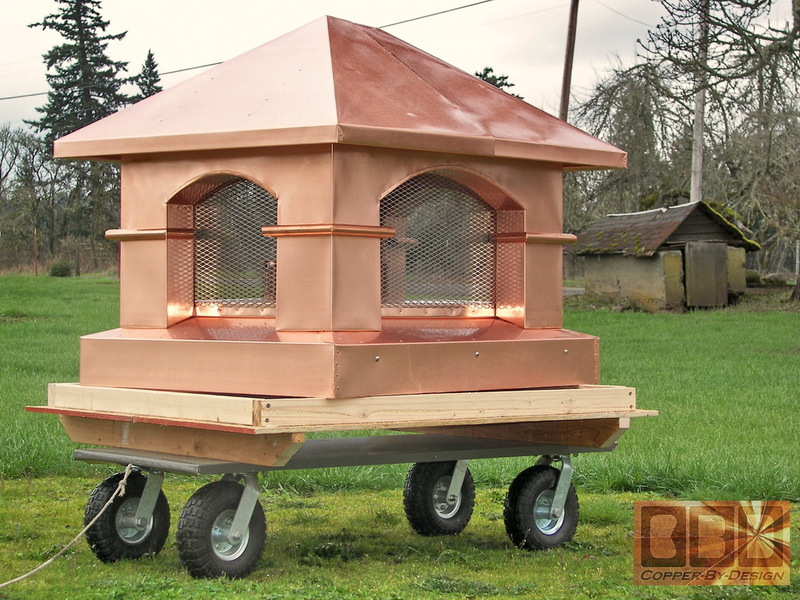 This copper chimney pipe cover and cap projects is for client Steve Fenley in Mulino, Oregon. 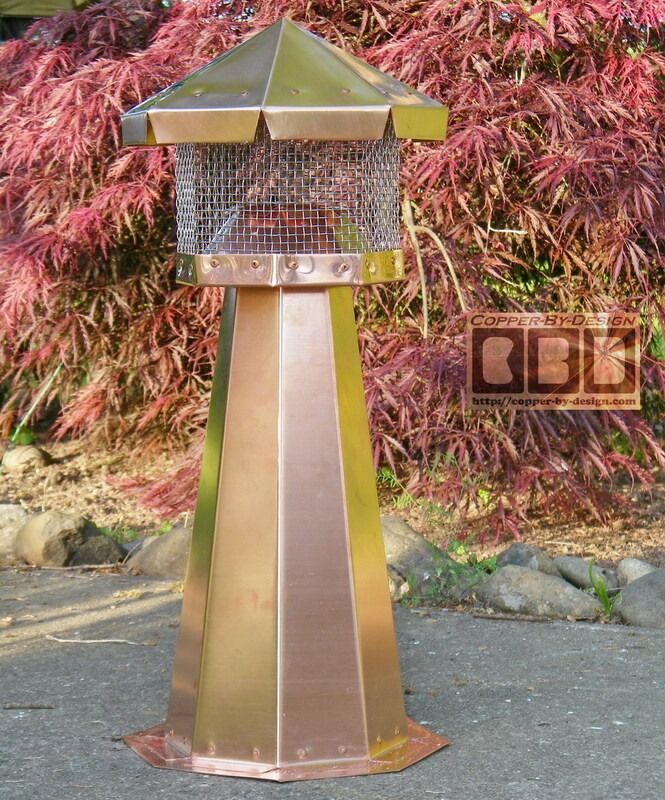 It is for their 8" stainless steel chimney pipe that is stained with rust streaks. The inside of the base chamber is 22" x 24". The flashing flange is 34" x 36" for a 6" wide flashing all around. 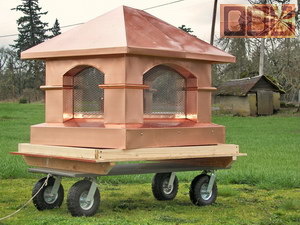 I made it with a wider base so there would be no need for the roof braces to hold it steady in high winds. 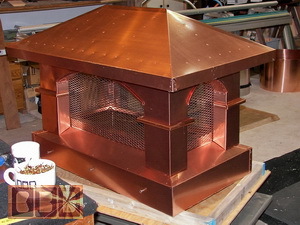 This copper chimney cap projects is for a client in Connecticut (name and City removed 12/08 at client's request, first time ever). 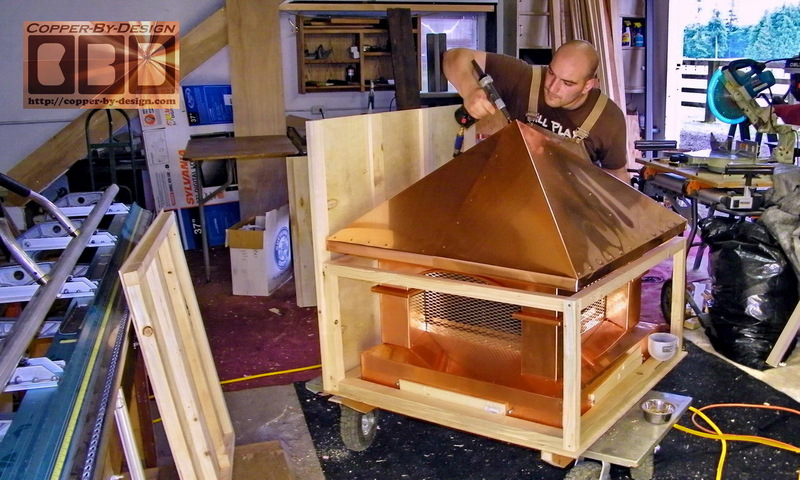 We spent nearly 2 years working out the details of this project since his first e-mail. 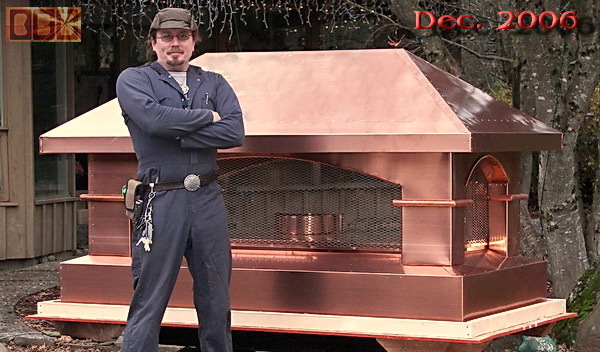 He had contracted with me to cover another larger chimney as well, but had to cancel the other project do to lack of funds last minute. 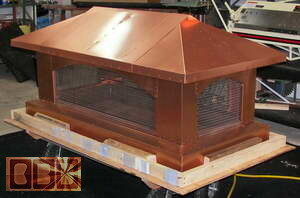 The inside of the base is 22" x 39". The roof of this is made at a 6/12 pitch and has a 3" overhang past the sides of the base on all sides. This copper chimney cap projects is for contractor Daniel G. Corker Jr. of DACO Interiors, Inc. (804) 798-2470 in Ashland, Virginia for his client in Mechanicsville, VA. 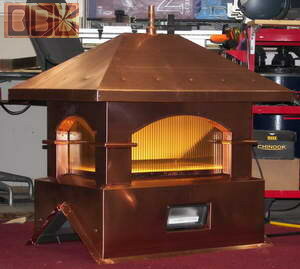 It is for their gas log fireplace. 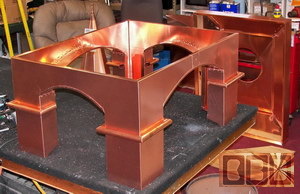 The inside of the base is 35" x 43.5". 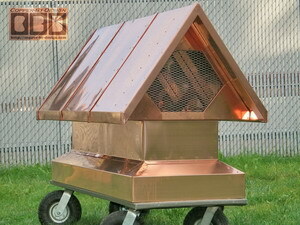 The roof of this is made at a 8/12 pitch and has just a 2" overhang past the sides of the base on all sides. 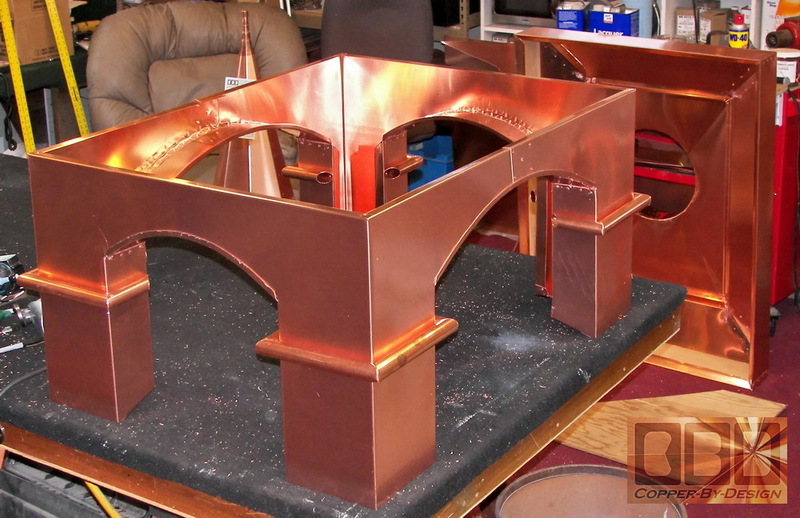 Note: I under bid this project by $836.63 mainly by not including the pan/collar and the eaves in that quote, but I stuck the the price I had quoted him of course. He was a very good client to work with. 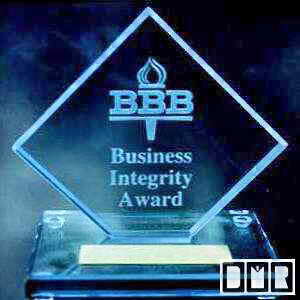 I would recommend this contractor if you happen to be in that area. This copper chimney cap projects is for Brad and Pam Stone in Summit, New Jersey. It was made for their outdoor fireplace. 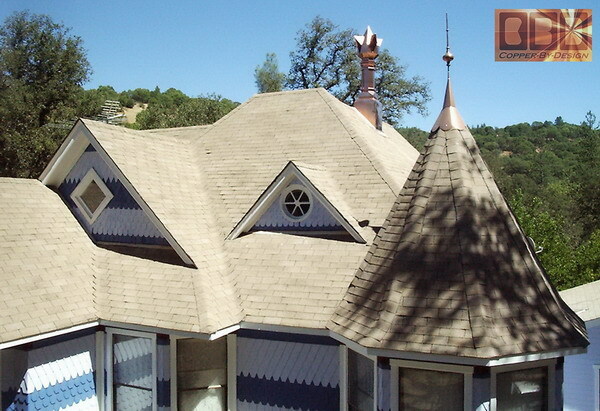 He may have me build some chimney caps for his house as well that match this design. 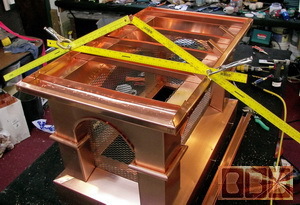 The inside of the base is 31.25" both ways. I made this with no eave past the base and it has a deeper set stainless steel screen in the archway than I had made in the past. It has solid oak boards inside the base skirt. 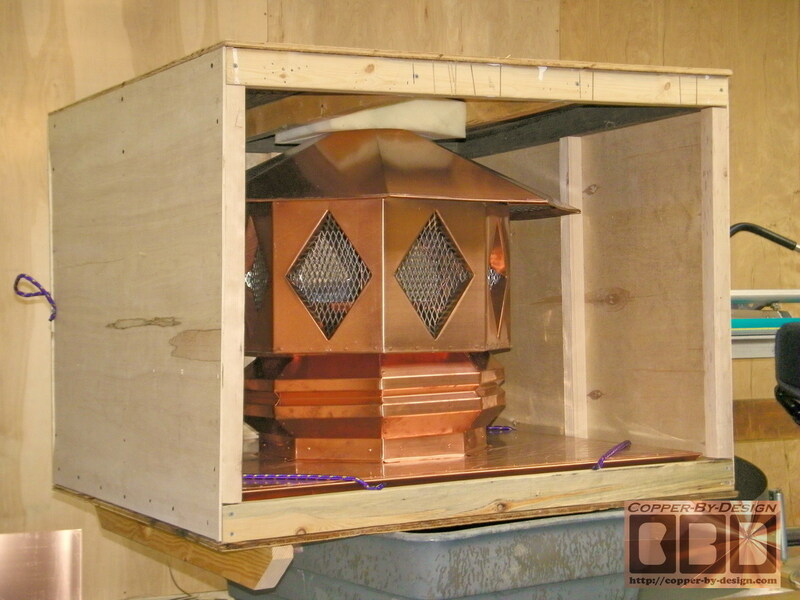 This copper chimney cap projects is for Joe and Mary McLaughlin in Staten Island, New York. 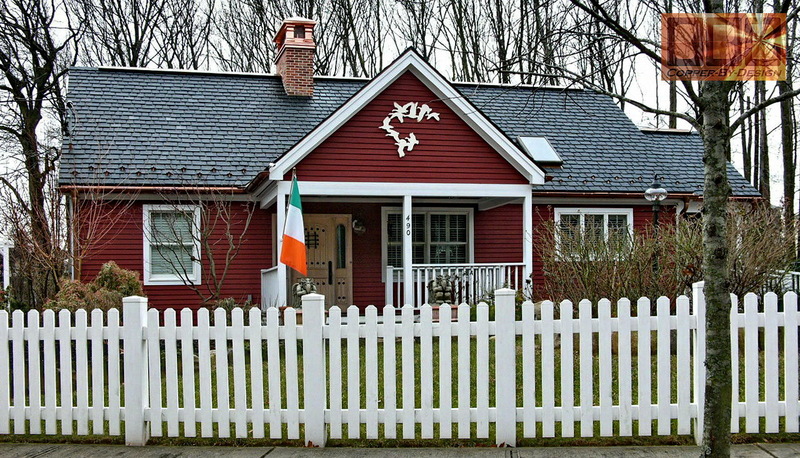 They had just a metal chimney pipe sticking up out of the roof. He had a contractor build a large rectangular wood box around it and cover it with a thin layer of brick. 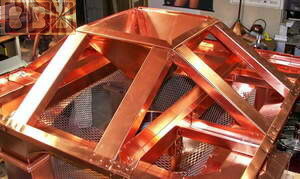 The inside diameter of the base needed to be 61.5" x 26.5". 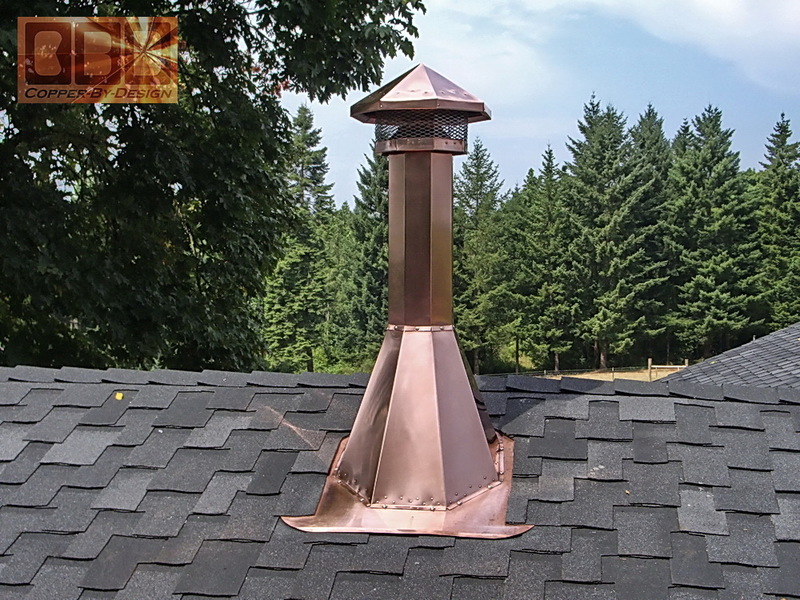 To cover this new traditional looking chimney we worked with them for 3 months exchanging over 70 e-mails with several photos and diagrams to finalize this design, that best suited their needs and desires for this custom chimney cap to fit with their home. 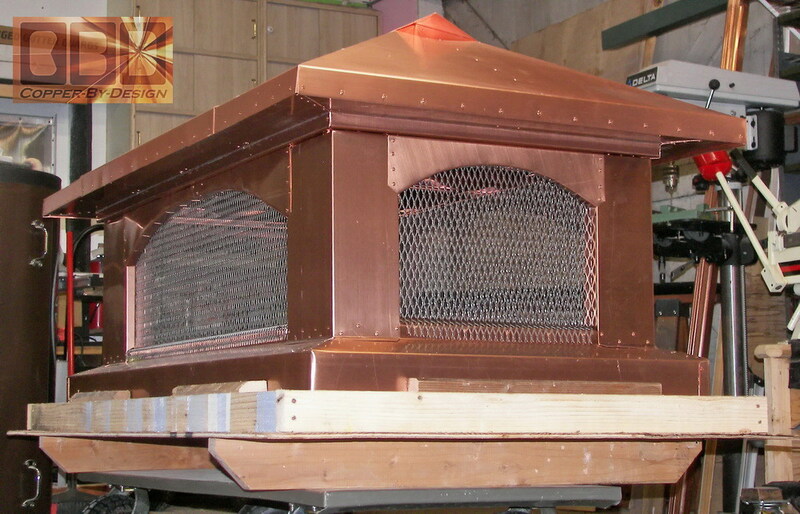 This copper chimney cap projects is for Gary and Susan Reeves in Springfield, Illinois. 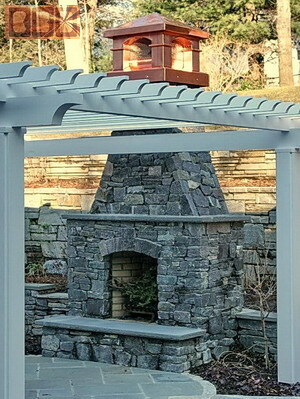 They had their chimney rebuilt and covered with natural stone. 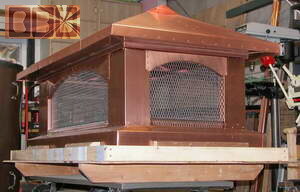 The inside base: 59.75" x 30.25". They would have loved to get a fancier chimney cap, like our arched Tuscan style, but their funds were limited. They requested a quote for a simple low profile chimney cap like I made for LEA Construction. I kept in mind what style they really wanted and made them this simplified cross blend between those two styles. 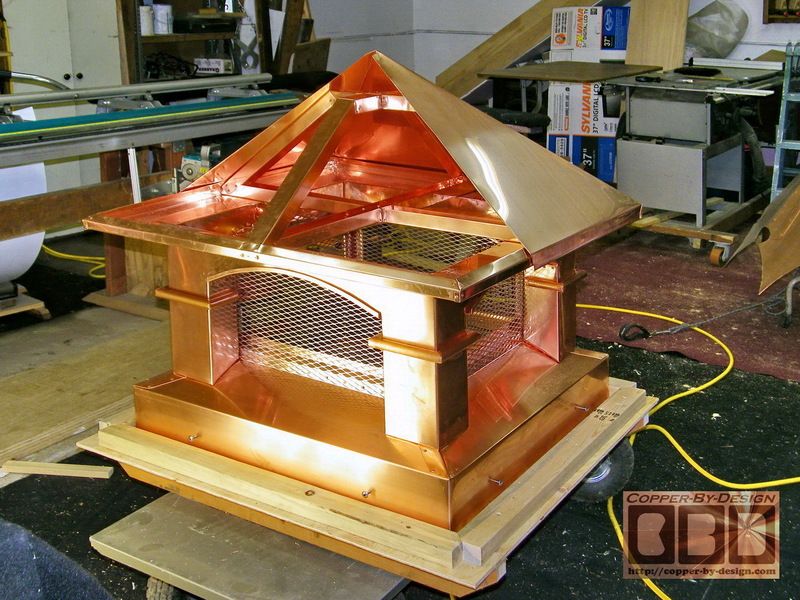 This copper chimney projects was for a client named Jack and Lynn Willard in Grass Valley, California. We had just made them an 8 sided turret roof cap with a Morgana style finial seen here in the fore ground, and I noticed in some photos he sent us that there was bricks dislodged from his chimney. 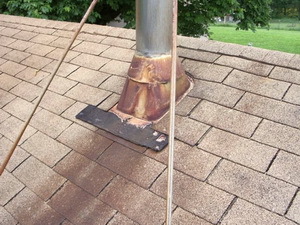 This was an unexpected repair and he did not know what to do for a lasting solution. After careful negotiations we came up with this alternative solution to his problem. I built the whole unit in 2 separate parts for easier installation. This is also important for vertical alignment of the flue pipe incase the base does not set on the roof perfectly level once installed. Then the flue was riveted to the base. The inside base: 24" x 24". 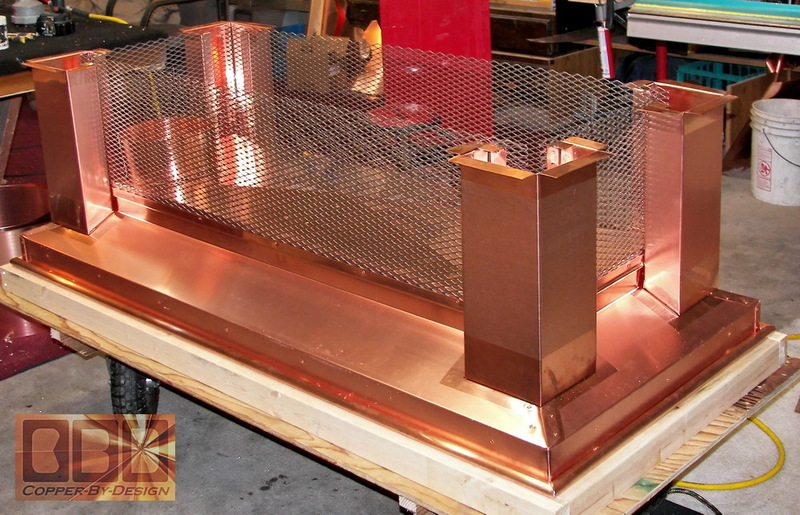 This copper chimney projects was built for our client named Gina Matury who made this diagram for Lake Prairie Homes, LLC at 9308 Chestnut Lane in Munster, IN 46321. You can phone her at (219) 614-5144. 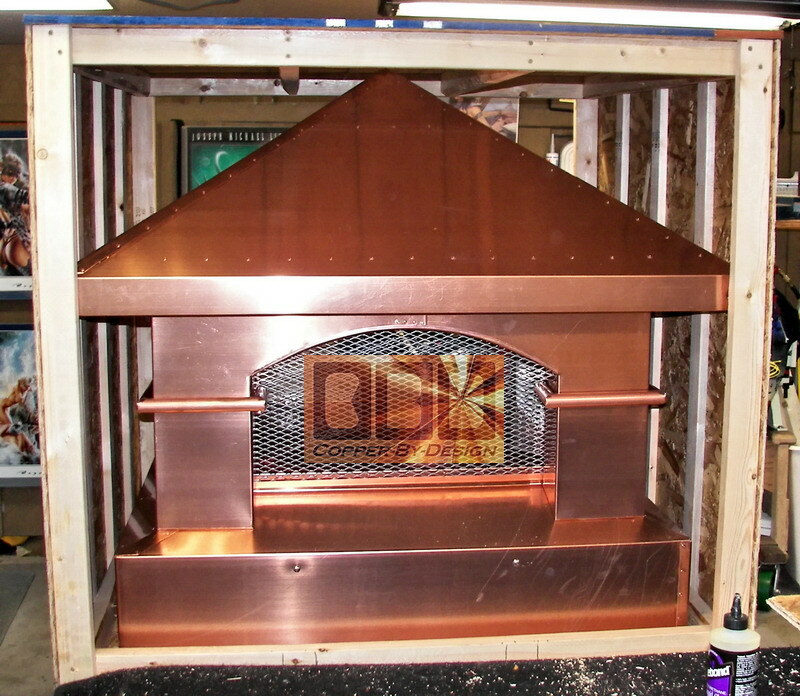 Most of the metal I work with is 20oz copper sheet metal, but the base chamber here is made from a 4' x 8' sheet of a thicker 32oz copper for more strength to hold the flue pipe sturdy in high wind situations. I built this in 2 separate parts for easier installation. This is also important for vertical alignment of the flue pipe incase the base does not set on the roof perfectly level once installed. 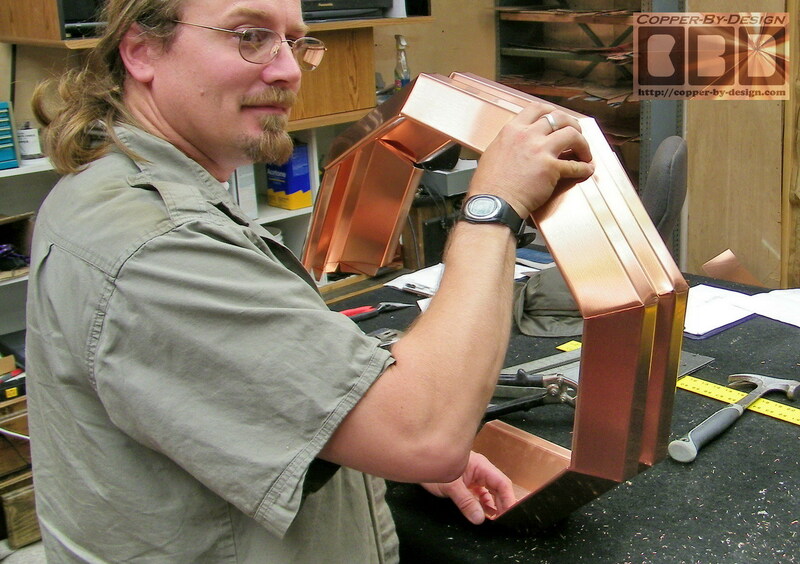 Then they will screw or rivet them together. 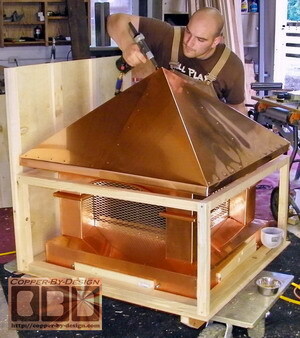 The inside base: 20" x 20". 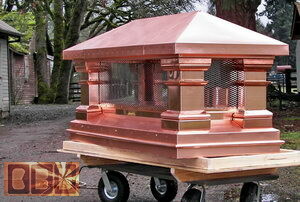 It was my job to recreate her design into a full size 3 dimensional work of art. I think I did a pretty good job here. The 16 gauge stainless steel screen also adds to the strength after it is riveted tightly in place behind the corner columns. 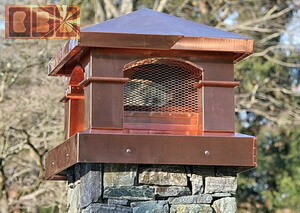 This is the 6th in a row Tuscan style design chimney cap I built that all went to the NY and NJ area. 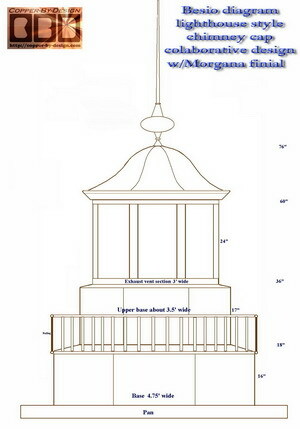 This chimney cap was for a client named John Berrigan through his general contractor: D. L. Minor construction (609-861-2138) in Cape May Court House New Jersey. They had a concept drawing made by Paul Kiss of Olivieri, Shousky & Kiss to help the homeowners decide what style of chimney cap would look best on their house, which you can see faded in the background. 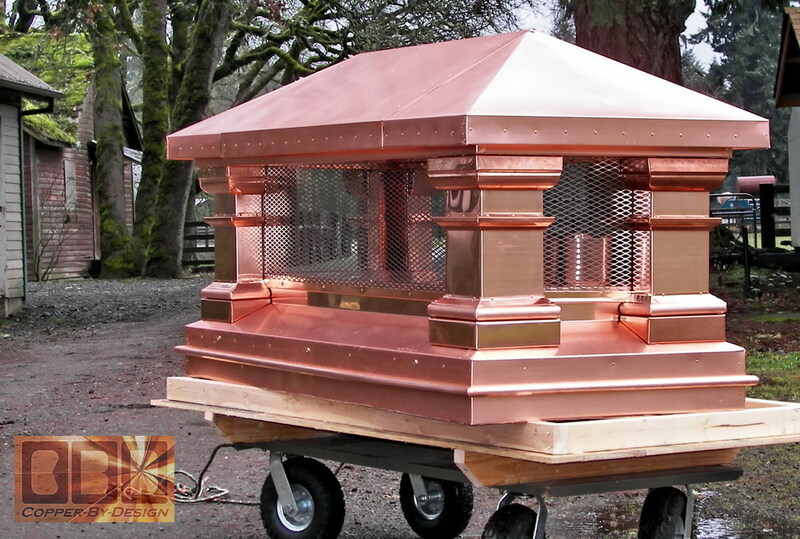 It went through several revisions before we got all the angles and proportions just right. 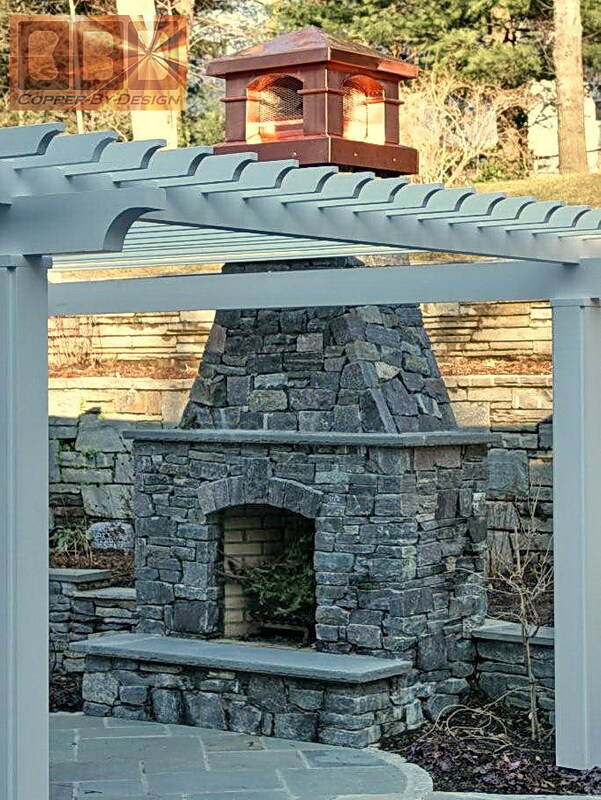 I built another set of 2 chimney caps that are designed after our Tuscan style arched chimney cap design for our clients named Bill & Brenda Gross through their general contractor named Bob O'Donnel in Chester New Jersey. 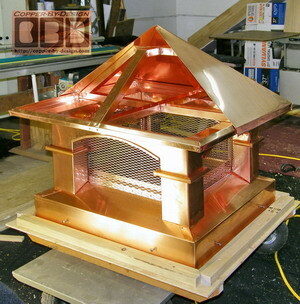 We shared about 100 digital photos with the client through e-mail during the construction process. Here below is the square Sister to the one above.